Railcar Covers can be manufactured with several different print options. A printed Railcar Cover is a great way to communicate to a large audience not only the product being shipped but more… a printed Railcar Cover tells a customer the quality of the product being shipped and associates this with a brand image. 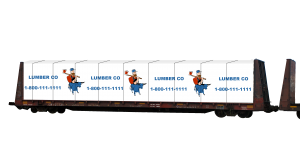 A printed Railcar Cover is a moving billboard- The image captures an audience upon the shipping route and is a cost effective way of protecting goods while utilizing an effective marketing option. Flexpak manufactures Railcar Covers in different methods and therefore can manufacture a cover with different print requirements. Four large prints can be made viewable along the sides of the rail the entire height of the railcar. Flexpak can make a single large print in the middle of the railcar, or can manufacture a random repeated cover using the entire area as a platform for an effective printed pattern. While the standard is a four color print on Railcar Covers, Flexpak can manufacture a number of different covers with Hybrid design.